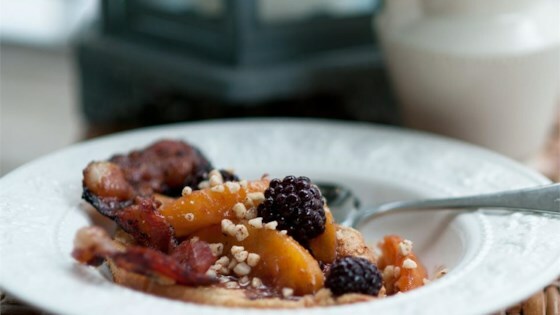 "A grain-free alternative to one of our favorite breakfast dishes, it's quick and easy to make and delicious! It's perfect for those with gluten intolerance or following a grain-free or paleo lifestyle. Sprinkle with finely chopped, toasted nuts (we love hazelnuts!)." Preheat oven to 425 degrees F (220 degrees C). Put butter in a 9x13-inch casserole dish and place in the oven until butter melts and starts to brown, about 5 minutes. Place eggs in a blender and pulse until smooth; add coconut milk, arrowroot powder, chestnut flour, lemon extract, stevia powder, and sea salt. Blend until smooth, 45 to 60 seconds. Pour batter over browned butter in the casserole dish. Bake in the preheated oven until pancake is set in the middle and edges are lightly browned, about 23 minutes. See how to make these delicious and impressive brunch treats. This is one of our favorite go-to recipes for a delicious and surprisingly easy, filling breakfast for our family of seven! I used almond flour because I had it on hand, and my family loved it!